The .204 Ruger is nipping at the heels of the venerable .22-250, challenging it as the favorite cartridge of savvy long-range varmint and predator hunters. The considerably smaller .204 has proven itself potent enough for coyotes, with an equally flat trajectory and similar wind drift to the .22-250. And recoil with the .204 is so negligible a shooter can watch through the scope as the bullet strikes, noting the little puff of dust and correcting “on the fly” for fast follow-up shots. Because the .22-250 produces more recoil, the shooter cannot maintain continuous sight of the target in the scope and needs a spotter to call misses. The .223 Remington has long been the alternative to the .22-250, and the ability to follow misses has always been part of this milder round’s appeal, too. But bullet drop with the .223 is considerably more pronounced than with either a .22-250 or a .204, limiting effective hunting range to 300 yards or so. The bullet also drifts considerably more in a crosswind. Of course, plenty of hunters are perfectly happy calling 350 yards a long shot. They embrace the milder recoil of the .223 and declare that shooting a prairie dog, woodchuck, or even a coyote with a .22-250 is like swatting a fly with a hammer. The tsunami wave of popularity that is carrying military-styled .223 AR “black rifles” is also boosting the .223 cartridge’s popularity. Most of these rifles come with short barrels that produce even lower velocities, yet AR shooters don’t seem to mind, as very few opt for the longer, heavier barrels offered by some AR makers. The AR-15 is limited to the .223-diameter rim, so it is not chambered for the .22-250,. But AR-15s are chambered for the .204. If your preference is a black rifle, the choice is between .223 and .204. The .22-250 case holds considerably more powder than the .204 and can handle heavier bullets. But looked at another way, the smaller case of the .204 is quite efficient, and its most popular 40-grain hunting bullet is a proven coyote slayer. Where a proper handload for the .22-250 might use 38 grains of Hodgdon’s Varget to launch a 40-grain bullet at 4,150 feet a second, the .204 would use but 27.5 to launch its 40-grain bullet at 3,900 ft/s, and the more aerodynamic shape of the longer, thinner 20-caliber bullet would allow it to catch up close to the .22-250 downrange. The potent .22-250 remains the go-to cartridge for dumping energy on the largest, most distant predators (save, perhaps, for the .243). When loaded with such premium .224 bullets as Nosler’s 60-grain Partition, the Trophy Bonded or the Barnes X, one might make a case that the .22-250 is a perfectly legitimate round for antelope and even deer. But while many hunters still fear that the .204 is a bit light for coyotes, it’s splitting hairs to say the .22-250 holds any real performance edge for smaller critters. When the .204 Ruger came out in 2004, the first thing I wondered was why it took so long. A couple of 20-caliber wildcats already enjoyed a loyal if limited following among serious handloaders. In his book Woodchucks and Woodchuck Rifles, published in 1951, G.S. Landis, of .17 Landis Woodsman fame, listed the wildcat .200 Asp Express, built by Steve Gault of Lafayette, New York. Landis even included five pages written by Gault, explaining why he thought the ideal chuck cartridge would lie somewhere between .172 and .224. No date was given for Gault’s musings, but he did refer to the .30-06 as the .30-1906. P.O. Ackley’s popular Handbook for Shooters and Reloaders, Volume 1, printed in 1962, includes reloading data for a .20/.222 wildcat, and he suggested back then that a better cartridge might be made by necking down the .222 Remington Magnum, forerunner to the modern .223. The .204 Ruger case is .090-inch longer than the .223, with a 30-degree shoulder that gives more length at full body diameter. This provides about 5 percent more powder space than is found in the .223 case. Since 40-grain bullets are popular for hunting coyotes with both the .204 and .22-250, let’s compare their performance with data from the software program Sierra Exterior Ballistics, Infinity, Version 6. The .204 bullet is a bit slower at the muzzle, but its higher ballistic coefficient allows it to catch up. The .22-250 has 13 percent more energy at the muzzle, but at 400 yards, the difference is under 5 percent, with the .204 packing 449 foot-pounds compared to 470 for the .22-250. Trust me, a coyote won’t notice that difference. At 400 yards, the .22-250 has dropped 14.6 inches from a 200-yard zero. The .204 hits but an inch lower and has a smidgen less wind deflection. When shooting distant targets these days, I’d rather deal with bullet drop than wind drift. Tables for drop and wind can be taped to a rifle’s buttstock or to the bell of the scope. But while a laser rangefinder gives precise distances for calculating holdover, the wind on your cheek could easily be very different downrange, and the speed number needed to calculate a left or right hold remains a rough field estimation, at best. With a bigger 50- or 55-grain bullet, the .22-250 delivers considerably more energy at 400 yards, with 600 ft lbs. Still, the 449 pounds delivered by a 40-grain .204 is plenty enough for a coyote, and both trajectory and wind deflection remain comparable to even the bigger .22-250 bullets. And the .204 is much more of a pleasure to shoot. Barnes makes a pelt-saving predator bullet called the Grenade that literally blows apart on impact, a best choice for saving pelts. Grenades are necessarily lighter than more conventional bullets because the core is compressed copper/tin instead of lead; the .224 version used in the .22-250 weighs a mere 36 grains. According to Hodgdon’s Reloading Data Center, the .22-250 can drive the light 36-grain bullet over 4,300 ft/s. However, the light weight also means a low ballistic coefficient of .131. This may not be the bullet for long-range woodchuck sniping, but when the goal is to save pelts, a low ballistic coefficient may not be such a bad thing. The initial high velocity provides a flat trajectory out to mid range, where a loss of velocity and energy help to reduce the risk of pelt damage. Barnes makes a 50-grain .224 Grenade, but it requires a .22-250 rifling twist of 1:10 or faster. If you think 36 grains is light for the .22-250, the Grenade for the .204 weighs only 26 grains, and Hodgdon data says it can be driven to over 4,300 ft/s. By stepping down in conventional bullet weight from 40 grains to 32 grains, muzzle velocity in the .204 increases from 3,900 to 4,225 ft/s, according to Hornady’s 2011 catalog. Muzzle energies are similar, and trajectories are almost identical out to 500 yards. But because of the lower ballistic coefficient, the 32-grainer impacts with considerably less energy beyond 200 yards; again, not a bad thing when the goal is to harvest the pelt. 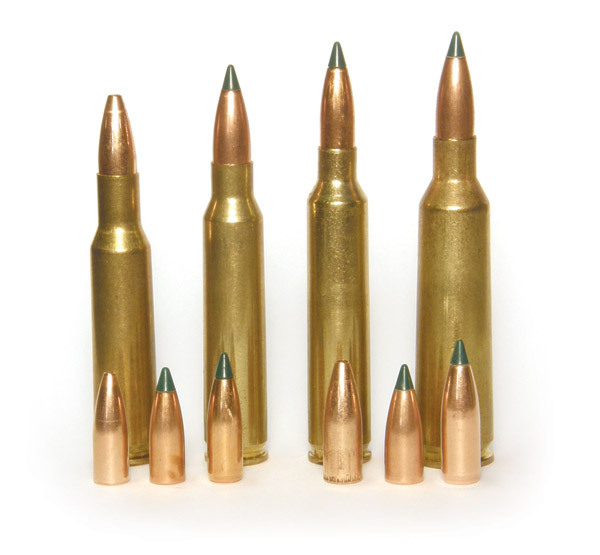 The .22-250 will always hold an edge when it comes to heavier bullets for bigger predators. In fact, specialty bullets that weigh 70 to 90 grains are hinting at a whole new world for the .22-250 as a big-game round, though they do require special barrels with faster rifling twist than what is used for the more common 40- to 60-grain bullets. But for coyotes and smaller critters, comparable long-range performance with milder blast and recoil and lower powder costs may be tipping the scale in favor of the .204, or at least ensuring its future. Accuracy with either cartridge can be excellent, more an issue of the rifle and the shooter’s abilities. The most popular benchrest cartridge was once the .222 but today is a small-case 6mm. Hunters will always argue for their favorites, and when it comes to coyotes and smaller critters at long range, an argument can be made for either the venerable .22-250 or the upstart .204 Ruger. And while the .223 may be a step behind in terms of long-range performance, the .223 AR has vaulted it to No. 1 in popularity.